Juicing is gaining attention on the health and wellness circuit as a popular method for increasing your fruit and vegetable intake. The nutritional benefits of juicing are often debated in the medical community, but proponents of juicing give it credit for weight loss, faster nutrient absorption, detoxification, increased hydration, and prevention of illness. Juicers work by extracting the liquids, vitamins and minerals from raw produce, leaving behind the fibrous pulp. While fresh juice is not a substitute for whole fruits and vegetables, it is an excellent way to incorporate a wider variety of fruit and vegetables into your diet. Fresh juice is not pasteurized, so it must be consumed very quickly. For optimum nutrient absorption, you should drink your juice the same day it is made. Keeping a batch of fresh pressed juiced for no more than 2 or 3 days is the best way to avoid foodborne illnesses. What’s in your juice is super important too. Be cautious of recipes that are heavy on the fruit. While it is sure to taste delicious, fruits contains way more calories and sugar than their vegetable counterparts. It diminishes the nutritional value and it can ultimately lead to weight gain when you add too many fruits. The most nutritious method is to have a vegetable based juice with one or two fruits added for flavor enhancement. If you plan to incorporate juicing into your nutritional regimen, the big question is: Do you make the juice yourself or do you rely on store bought varieties? The answer will depend on a few factors. The most important factor being time. If you have the time to make your own juice that is probably the best way to ensure that the quality and freshness of your juice. Plus, you are in complete control of the juice production process. You can pick the fruits and vegetables that best meet your nutritional needs and you can make the amount of juice you desire. That being said, one thing to be wary of when making homemade juice is the source of your produce. The Dirty Dozen is a list of the 12 most contaminated (with herbicides and pesticides) fruits and vegetables. This is the list of produce you should try and buy organic whenever possible, but especially when juicing. It’s relatively cost effective to make homemade juice and there is a juicer on the market at every price point. However, making juice at home can be a time consuming process, so for those with tight schedules buying juice from your local juicery may be the best plan of action. Doing your research before settling on a particular juicery is the best way to ensure both quality and happiness. Looking into the juice blends that they make, where they source their produce from (is it local? is it organic? how often do they receive deliveries? ), how often they make juice (how many times a day), if they allow custom juice orders, their prices, and the cleanliness of the establishment is of the utmost importance. If you’re considering juicing and looking for a local juice shop to try out, look no further than Happy Apple Juicery. Happy Apple Juicery is “a mobile delivery service of fresh, raw, cold-pressed organic juice- serving Charlotte and its surrounding areas”. It started as a way for owner Shatarra Deveaux to manage her severe acid reflux, and her passion project turned into a full fledged business aimed at making healthy accessible. Deveaux contributes daily juicing combined with a healthy diet to removing the need to control her reflux with daily medication. Deliveries and pickups for Happy Apple Juicery’s delicious products are Sunday and Thursday of every week! Whether you juice at home or visit your local juicery, consuming freshly pressed juice is a quick and easy way to help you reach your daily fruit and vegetable limits (quotas). For people who don’t like fruits and vegetables, juicing them may be the key to increasing your daily intake. Either way, juice is an excellent source of vitamins and phytonutrients!! Just remember to be mindful and do your research!! It is important to note that if you are currently taking prescription drugs, you should consult your doctor before juicing extensively to avoid any potentially adverse reactions. While we have yet to discover the elusive “fountain of youth”, consuming salmon regularly might get you pretty close. Salmon contains an antioxidant (Astaxanthin) that helps slow down the aging process. 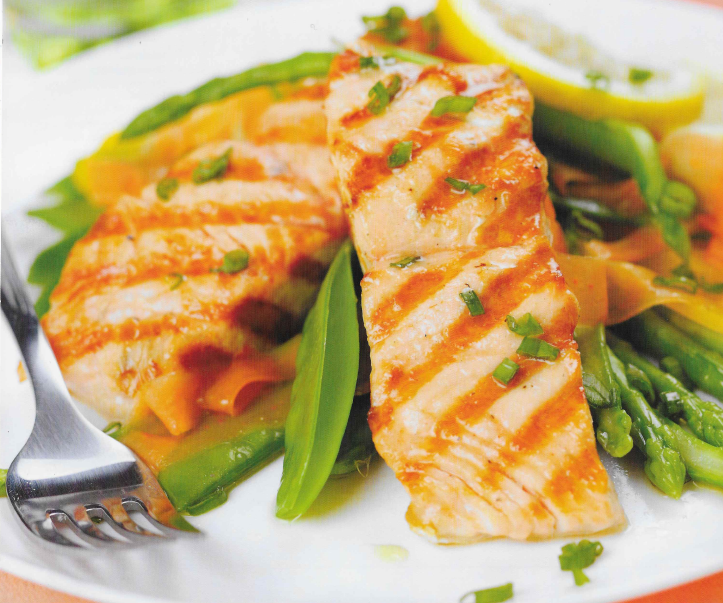 Salmon is an easy protein to digest, easy to prepare, and highly nutritious. While most are aware that salmon contains a healthy dose of omega-3 fatty acids which help to keep skin soft and selenium which provides the skin with protection from sun exposure, few realize that salmon is also a rich source of vitamin D, and research shows us that many people are deficient in it. It’s All About the Kale! Everyday we are inundated about the merits of kale, however is kale all that it’s cracked up to be or is it just another fad or passing craze? Of all the dark leafy greens, I simply LOVE kale and never get tired of eating it! It’s sweet in taste and is able to be consumed in a plethora of ways, including baked, broiled, fried, steamed, juiced, etc. Kale delivers a hefty supply of powerhouse vitamins like Vitamin A, Vitamin C, and Vitamin K, as well as other essential nutrients for the skin and hair. Vitamin A is one of the most skin-essential vitamins around. Vitamin A supports skin cell turnover, the process of replacing dead skin cells with healthier new skin cells. Without adequate Vitamin A, skin becomes dry, tough, and scaly, because the top layers of dead skin cells are continuously building on top of each other, and not being removed and replaced by newer skin cells. Lack of vitamin A can also weaken the skin, so wounds heal at a slower pace. So since your skin is an integral part of your immune system, strengthening this barrier by promoting cell production will help protect your skin from infection or other unhealthy irritants. Vitamin C is an antioxidant, which helps reduce damage caused by free radicals. This damage includes premature aging of the skin caused by overexposure to the sun. Antioxidants in kale can help keep your skin youthful! Vitamin K is as a powerful ingredient found in many skin care products that helps diminish puffiness and dark circles under your eyes. Like Vitamin C, it also has anti-inflammatory benefits that helps with bloating and prevents puffiness around your face. The anti-inflammatory property also reduces redness and flakiness of the skin. The mineral Copper boosts the production of melanin, a pigment that protects your skin from the sun. Copper also helps produce more collagen like its buddy, Vitamin C and promotes wound healing. 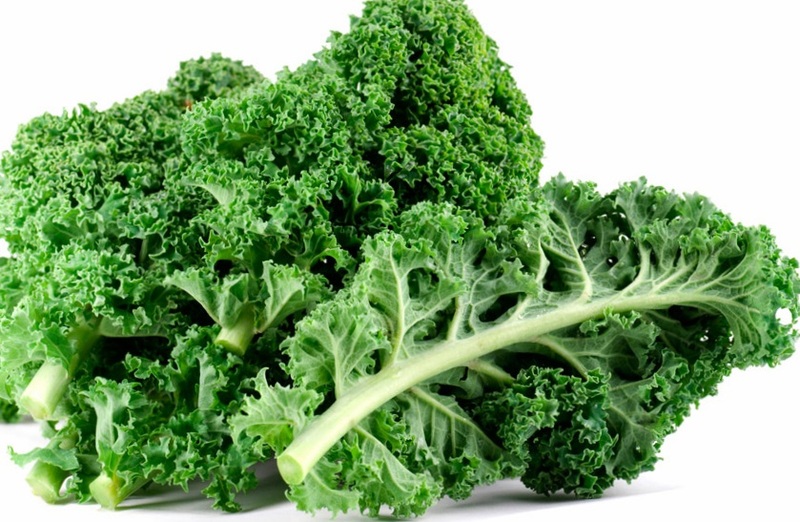 Omega-3, Omega-6 fatty acids, and iron are also found in kale. These nutrients can help boost the elasticity, strength, and growth of your hair. So, without hesitation, dive into one of my favorite superfoods…the queen of Vitamin A and a powerful source of other noble nutrients…ALL HAIL TO THE KALE! Note: My other green and leafy top picks include the following: spinach, turnip greens, broccoli, arugula, swiss chard and bok choy. Place of Origin: Acai berries grow in the Amazon rainforest region of Brazil. What is it: Acai is a tiny purple berry (and powerful superfruit) that grows on palm trees in the Amazon. What are the benefits: Acai berries help support natural energy, healthy hair, skin and nails, as well as antioxidant levels. Why it’s important for women: Women need protein, fiber, omega fatty acids and antioxidants. How to incorporate into diet/everyday routine: With a variety of Acai products available in the market, incorporating Acai into your daily diet/everyday routine is pretty easy. One popular way to get your daily does of Acai is in the delicious chew form – they’re about the size of a postage stamp, but can pack some nutritional punch. Place of Origin: Thailand and other tropical regions. What is it: The liquid extracted from a young, green coconut. What are the benefits: Coconut water supports the balancing of your body’s electrolytes, as well as promotes natural energy and healthy hydration. Why it’s important for women: Lack of energy is a common complaint of women, oftentimes due to dehydration. How to incorporate into diet/everyday routine: Coconut water is in liquid form and is easy to drink. You can feel the hydration almost instantly when drinking coconut water. It is Nature’s hydration drink, which hydrates without the sugar and calories of most sports/fitness drinks. I’d suggest making coconut water part of your daily regimen. It tastes great and hydrates better than water. Place of Origin: Sea buckthorn hails from some of the harshest environments of Eastern Asia, Mongolia and the Himalayan Mountain regions. What is it: A tiny, sour and pungent orange berry that is no larger than a pea, but packed with vitamin C and other powerful nutrients. What are the benefits: Sea buckthorn supports healthy skin, hair and nails, as well as promotes healthy energy and immune support. Why it’s important for women: Antioxidants are even more important for women as they age. How to incorporate into diet/everyday routine: Sea buckthorn in natural form (i.e. the berries) is not typically found at local grocery stores. However, liquid supplements and soft gel capsules are becoming increasingly available at stores and online. Just a note – because of its very tart and pungent flavor, you may want to mix or chase it with a juice or tea. Place of Origin: The tropical belt: countries within the 10 degrees N and 10 degrees S of the equator. What is it: Cacao (theobroma cacao) is the purest, rawest form of chocolate. What are the benefits: Cacao is an antioxidant powerhouse that helps support healthy antioxidant levels and heart health, plus natural energy, mental alertness and focus. Why it’s important for women: Many women are deficient in the mineral magnesium (which is one reason why women crave chocolate when it’s that time of the month). Magnesium supports a healthy heart and is needed for your body to be able to absorb and utilize calcium. How to incorporate into diet/everyday routine: Cacao is one of the easiest superfoods to incorporate into your daily diet and routine. Who doesn’t love chocolate? Place of Origin: Mangosteen grows in the jungles of Thailand. What is it: Mangosteen is a small, white-fleshed fruit with a dark purple rind that tastes sweet (a cross between a strawberry and a peach). What are the benefits: Mangosteen contains over 40 xanthones (super potent antioxidants) that help fight free radical damage, as well as keep your body’s inflammatory responses in check. Why it’s important for women: As women age, risk of inflammatory health concerns rise. Also, it’s not secret that with age come weaker joints. How to incorporate into diet/everyday routine: You would have to fly all the way to Thailand to actually get fresh Mangosteen. Luckily, Mangosteen is popping up at specialty grocery stores across the country in juice and liquid supplement forms. You can also make smoothies with these juices with a combination of fiber and yogurt. Place of Origin: Goji berries come from the valleys of the Himalayan mountain region of China, Mongolia and Tibet. What is it: Goji berries are small reddish orange berries that look kind of like tiny chili pepper that grow on bushes. What are the benefits: In Asia, goji is known as the “happy berry” for its ability to support positive moods, as well as a sharp mind, memory and eye health. Why it’s important for women: Hormones affect women’s health. And as women age, their health and mood-supporting hormones decrease. How to incorporate into diet/everyday routine: Since dried goji berries can be found at places like Whole Foods, it’s easy to incorporate this superfruit into an everyday routine/diet. Just sprinkle goji berries on your food such as oatmeal, yogurt, cereal, and salads. You can even bake them into side dishes or desserts. Beans – part of the legume family and great for feeling full. Contains fiber, B vitamins, iron, folate, potassium, magnesium and phytonutrients. Beauty benefits include increased strength and health of the root and strand of hair. Blueberries – another tasty superfood. Contains Carotenoids, Vitamins C & E, iron, niacin, polyphenols, and phytonutrients. Beauty benefits include increased hair root health through improved circulation. Also reduces the environmental effects on the skin. Broccoli – a real power food that contains fiber, folate, calcium, vitamins A & C, beta carotene, lutein, and vitamin K. Beauty benefit: broccoli increases the turnover rate of skin cells and protects against environmental damage. Green Tea – a much healthier choice than soda. Contains flavinoids, fluoride, and polyphenols. Beauty benefits include reducing cellular inflammation associated with the aging process and increased tooth strength. Oats – start your day off right. Contains fiber, protein, magnesium, potassium, zinc, copper, selenium and thiamine. Beauty benefits include increased hair strength, prevention of hair loss and color enrichment. Bet you never knew eating a bowl of oatmeal was good for your hair. Oranges – makes your mouth water just thinking of one, doesn’t it? Contains vitamin C, fiber, folate, potassium, polyphenols, and pectins. Beauty benefits include reducing the environmental effect on the skin. Pumpkin – and often overlooked superfood. Contains vitamins C and E, alpha and beta carotene, fiber, potassium, magnesium, and phytonutrients. Beauty benefits include keeping your skin supple and preventing damage from sunlight. Salmon– mighty tasty. Contains omega-3 fatty acids, B vitamins, selenium, potassium, protein and vitamin D. Beauty benefits include helping to reduce wrinkles and the harmful chemical levels associated with the aging process. Eating salmon regularly can also help reduce the severity of an acne breakout. The vitamins and minerals in this mighty fish can increase the strand strength of hair and encourage growth. Soy – a trendy food gaining more widespread acceptance. Contains omega-3 fatty acids, vitamin E, potassium, folate, magnesium and phytoestrogens. Beauty benefits: helps to reduce wrinkles and the chemicals associated with the aging process and can reduce the environmental effects on the skin. Spinach – the ultimate superfood. Contains omega-3 fatty acids, beta carotene, vitamins A, B & C, polyphenols, folic and alpha lipoic acid. Beauty benefits: all the things that make up spinach help to reduce wrinkles and the chemical levels associated with the aging process. Spinach can also help increase cell turnover (to continually produce new and healthy skin cells) and protect against environmental damage. Tomatoes– rounding out the superfoods perfect for a healthy diet. Contains vitamin C, alpha and beta carotene, lutein, fiber, lycopene, potassium, chromium and biotin. Beauty benefits: Protects skin against environmental damage and increases cell turnover which brings new healthy cells to the surface of your skin. Walnuts– Contains omega 3 Fatty Acids, vitamin E, protein, fiber, magnesium, polyphenols, and Vitamin B6. Beauty benefits include protecting the skin from UV damage. Yogurt – the perfect snack. Contains calcium, vitamin B 12, vitamin B2, zinc potassium and magnesium. Beauty benefits include boosting your immune system. Raw Nuts & Seeds (Almonds, Cashews, Flax, Hemp, Pecans, Pine Nuts, Macadamia, Sesame, Sunflower, Walnuts, etc. )Note: Avoid Hydrogenated and Partially Hydrogenated Oils such as cottonseed oil, soybean oil, and vegetable oils; Trans Fats such as margarine and synthetic butters; Rancid Vegetable Oils such as corn oil, canola oil, or those labeled simply vegetable oil, located in practically every bread, cracker, cookie and boxed food. © Esthetics Center for Dermatology. Made by RMD.